ASPECT Studios voted winner of San Francisco’s Tenderloin regeneration competition. Design has the power to transform the character of an entire neighbourhood and the lives of those who live within it. This was the purpose of the recent international ideas and design competition, San Francisco 2016, which challenged the world’s creative community to imagine ways of transforming the city’s troubled Tenderloin district into a place where the community can thrive. San Francisco’s Tenderloin district has long been affected by drugs, crime, prostitution, homelessness and poverty. 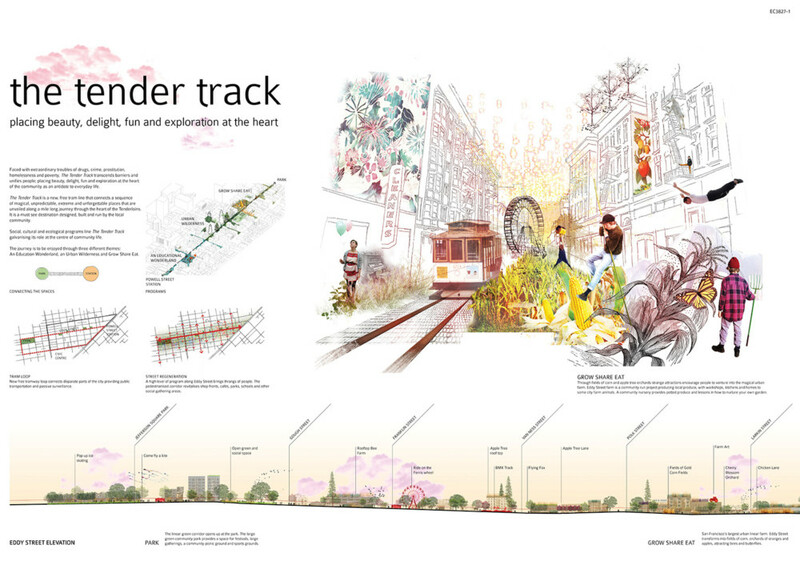 Our vision for “The Tender Track’ was a design that serves as an antidote to everyday life. It places beauty, delight, fun and exploration at the very heart of the community. Our winning entry was announced in the architecture and design e-zine, Eleven Magazine. 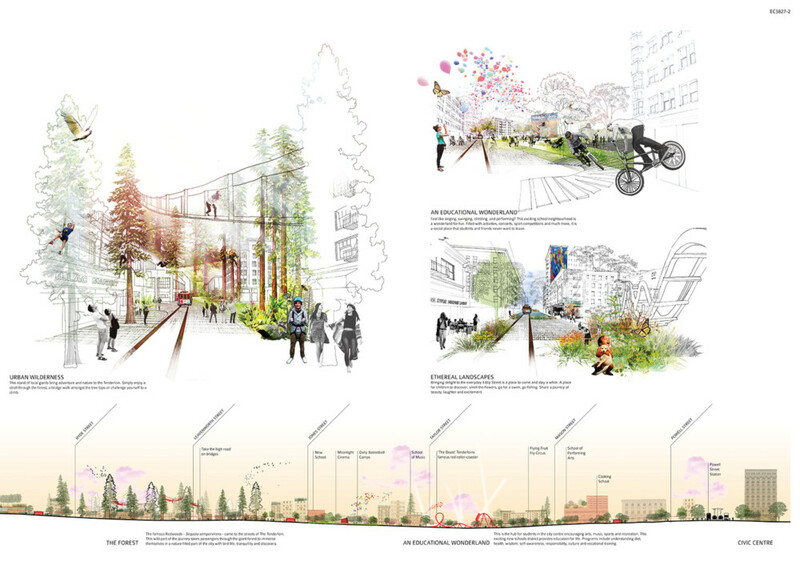 When describing The Tender Track, it wrote: “The jury loved this proposal from concept to presentation and particularly liked how the design team managed to weave together such an ambitious design in a coherent, contextual, innovative and yet feasible manner.” Central to our proposal was a free tramline that connects a sequence of unique spaces that are each built and run by an empowered local community. The journey has three primary themes: Education Wonderland, Urban Wilderness and Grow Share Eat. An Educational Wonderland Our submission included a series of new and existing schools to surround the ultimate adventure space, which features regular street activities and social gatherings within an open park. This new schools district provides education for life. Programs include understanding diet, health, wisdom, self-awareness, responsibility, culture and vocational training. 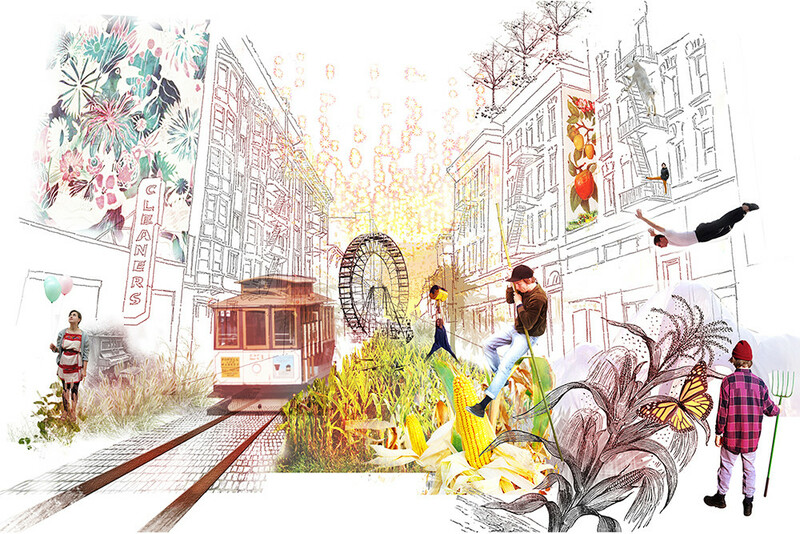 Urban Wilderness Buildings and streets would be colonised by indigenous plants, appealing to native fauna and creating sensory gardens that bring delight to the everyday and encourage people to explore their local ecology. This wild part of the journey would take passengers through a giant forest to immerse themselves in a nature-filled part of the city with bird life, tranquility and discovery. It’s a place for children to discover, smell the flowers, go for a swim or go fishing and share a journey of beauty, laughter and excitement. Grow Share Eat This space would serve as San Francisco’s largest urban farm. It is a community run project with local produce, workshops, kitchens and homes for city farm animals. Eddy Street, which is one of the main streets in the neighbourhood, would be transformed into fields of corn and apple and orange orchards to attract bees and butterflies. A community nursery would provide potted produce and lessons in how to nurture your own garden. The Tender Track presents an inspiring vision of transformation for one of the most troubled districts in the US. Congratulations to the team - Louise Pearson, Vicki Li, Matthew Drury, Thea Harris and Li Zuo - for their efforts in bringing this vision together.